Although temperatures are just beginning to subside in Arizona, several tree owners contacted us because their trees looked like they were dying. In most cases, the tree has gone into dormancy. We thought we’d explain winter dormancy and what you can expect your tree to do--and what you can do to see if your tree is still alive. 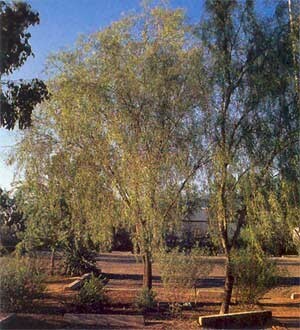 Many desert-adapted trees are deciduous, meaning they lose their leaves seasonally. Trees shed their leaves because they stop producing food (photosynthesis) due to environmental changes such as cold weather, not enough light, or extreme drought. 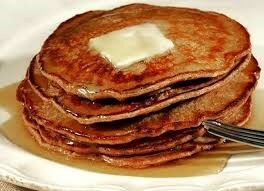 The tree remains alive by living off its store of carbohydrates in its roots. Dormancy is the tree version of hibernation, where everything slows down--metabolism, energy consumption, and growth. 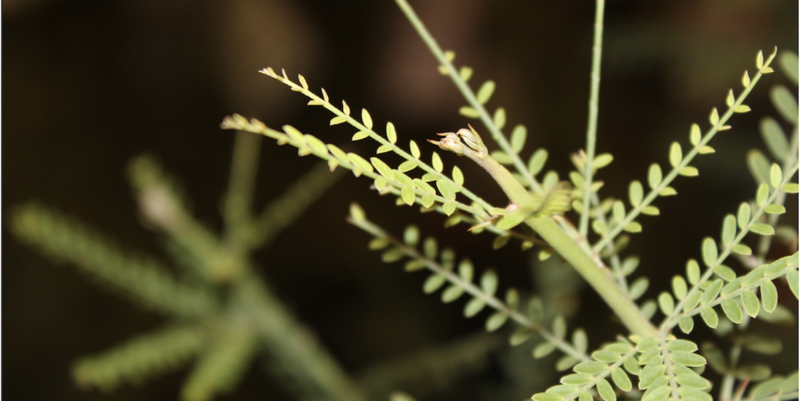 Leaves require energy to maintain and, therefore, are shed during dormancy. A chemical called abscisic acid is produced in terminal buds (where the stem connects to the leaf) that signals the leaf to break off and suspends tree growth. 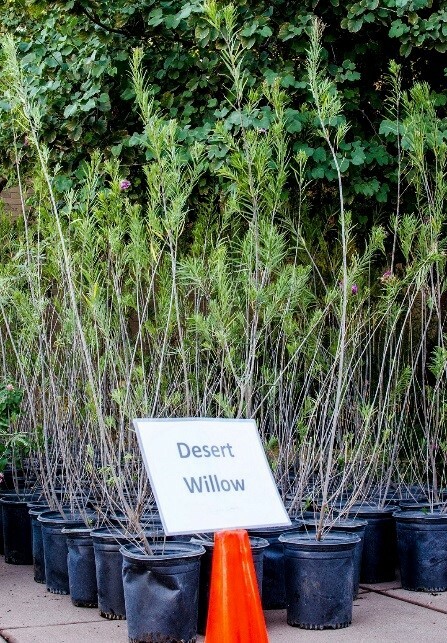 Often, when customers plant their trees in the fall or when fall approaches, leaves begin to fall off or in the case of Desert Willows--one of the tree types available through the Shade Tree Program--the tree stops blooming and flowers fall off. 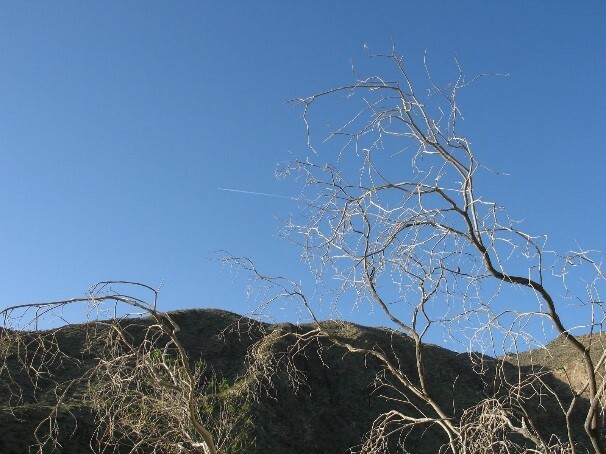 During the summer, desert-adapted trees such as the Desert Willow or the Willow Acacia (pictured right) are in full bloom but when the cold weather approaches, their branches look bare and dead (as pictured below). A simple way to tell if your tree is still alive is to test the flexibility and color of its twigs. Supple twigs that bend easily without breaking or still have green just under the bark are likely still OK. Twigs that break or snap or are brown under the bark may be dead. If you can’t tell, wait. A living tree will begin to sprout and produce new leaves when the conditions are appropriate. A dead tree will still be dead no matter how long you wait; it won’t get any “deader.” So when in doubt, wait for spring. If you are concerned about your tree or have a question, please post it on our forum under “Ask the Arborist…” and our volunteer Arborist Erik will answer it. 1. 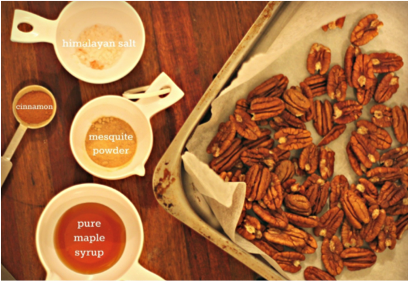 Scatter red chili flakes, cayenne pepper, or tobacco sauce around the tree. Dogs don’t like the smell or sneezing affect from the peppers, and the deterrents are not harmful to the tree. 2. Place cotton balls dipped in vinegar around the tree. Dogs will stay clear of the pungent smell. 3. If you can find some pine cones, scatter them around the base of the tree. Dogs don’t like the prickly feeling of the cones, so they should stay clear of the area. 4. Scatter decorative rocks around the tree. Again, Fido won’t like the feel of them on his paws. 5. Plant a prickly or thorny plant (or temporary place some) around the tree. When your dog loses interest in the area, you can remove the plants. Do you know other suggestions or have things that worked for you? 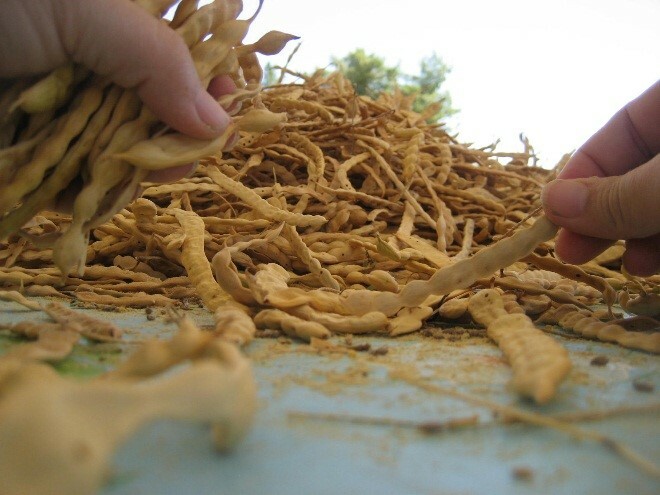 Please let us know if any of these helped keep your tree dog-free! 10. You can always drop it off at the VPA office where we will re-use them! We often get asked what people can do to prepare for their new trees and what they need to bring or know before attending their scheduled in-person workshop. Below is a list of some handy tips to help the process run as smooth as possible. 1. Check with your HOA before your workshop to find out if they have special guidelines about where and how to plant trees on your landscape or what types of trees are permissible. 2. Make sure that utility lines do not run through the spot you plan on placing your trees. You can contact Arizona 811 which will provide a free utilities location survey on your property. You can contact them online at http://www.arizona811.com/ or by phone at 1-800-782-5348. 4. Ensure that you have about 15 feet from the designated tree spot and the nearest southern, eastern, or western property obstruction (such as a wall). 5. You do NOT need to dig holes beforehand, and we actually prefer that customers do not dig until the workshop because you will learn the best way to dig a hole for your new trees and how to plant them properly. 6. You also do NOT need to rent a truck or bring a special vehicle such as an SUV for the tree. The saplings (pictured left) come in a 5-gallon base and are typically 3-6 feet tall, depending on the tree type. We’ve seen trees fit in just about any standard compact car. If you have an SUV, feel free to bring it but you can save gas by bringing your smaller, sedan car. 7. If the person picking up your trees is different than the name you registered under, make sure that person has an ID on them and the information used for the registration. 8. When you registered for the workshop, if you selected that no one will be attending the event with you but then change your mind, feel free to bring a spouse, friend, or other family member unless the class is completely full (we then often tell people not to bring guests in the reminder email sent out to the email address provided during the registration process). We hope these tips help answer some questions you may have. On the day of a tree workshop, we have a VPA cell phone specifically allotted for directions to the workshop or questions you may have; please feel free to call it: 602-618-5529. In lieu of the monsoon, we thought we’d provide some helpful tips about how to take care of your trees to make them stronger and, therefore, less vulnerable to damage during this time of the year. The word monsoon comes from Arabic and means “wind shift.” It’s this change in wind direction and speed that can really damage trees, new and old. 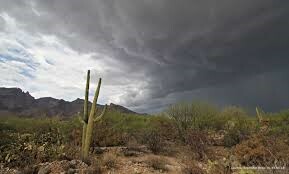 Monsoons in Arizona are typically between June 15th and Sep 30th. Along with violent wind, monsoons bring heavy rain which can over-saturate the soil around a tree and make the tree vulnerable to strong winds, as the roots have a weaker hold. Even old trees with healthy root systems can be yanked up by monsoon winds. Although trees cannot be completely sheltered from such damage, there are things you can do to mitigate it and strengthen a tree’s chance of surviving the season. Add mulch and fertilize to your trees consistently and adequately so your tree grows healthy and are better prepared to withstand the monsoons. Ensure that you are properly watering your trees so the soil does not become compacted or excessively big and heavy due to overwatering. (Refer to our blog on How to Properly Water Your Trees). Prune trees every year (or every 2-3 years, depending on the type of tree) because poorly pruned trees increase the chances of limbs and trunks snapping off. Reducing the canopy size by 10-15% makes it easier for the wind to pass through it. Desert adapted trees can be pruned from May-July, when they grow the fastest (in the middle of monsoons). Young or weak trees might need to be staked for additional support during this time. However, remove the stakes once the tree is stable. (Refer to our blog on How to Properly Stake a Tree). Keep an eye on your trees to spot early damage such as splitting along the branches or trunk and tend to it promptly. Remember that money spent on routine maintenance and care of your trees will be assuredly cheaper (and less time consuming) than repairing damage caused by snapped and uprooted trees. If you have some helpful tips or a monsoon success story (or failure and lesson learned), please share with us here or on our forum. 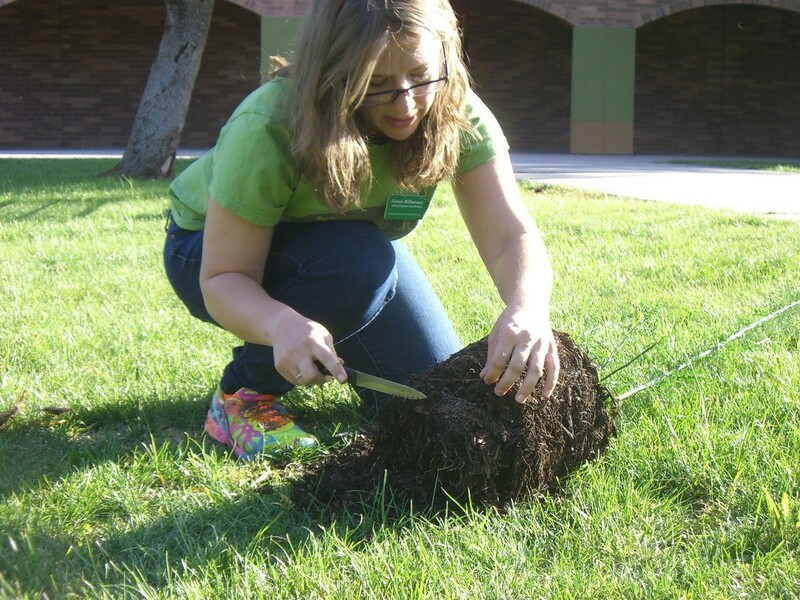 A couple months back, the VPA Shade Tree Program donated two saplings to Southwest Elementary School and Aimee Williamson, our program manager, gave a tutorial on how to plant the young trees. 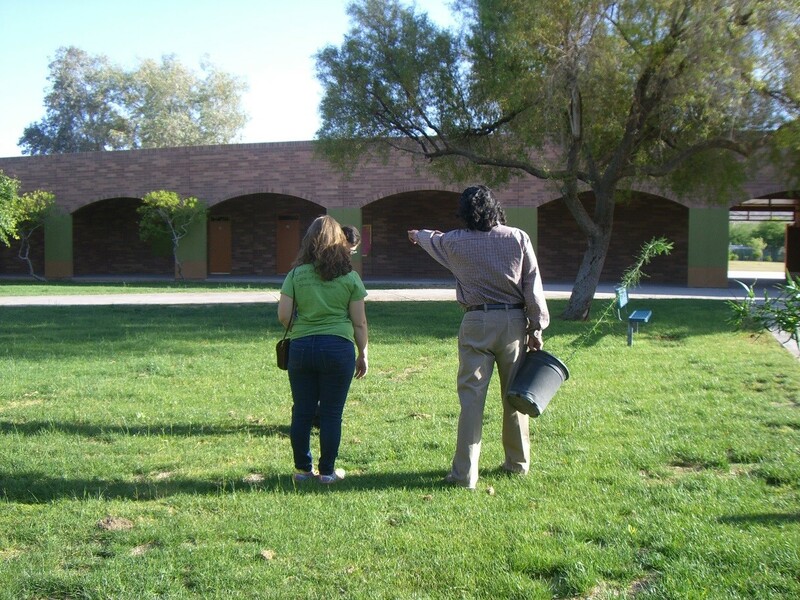 First, Aimee and the school’s principle, Mr. Juan Sierra, surveyed the open court to find the best place to plant the trees. 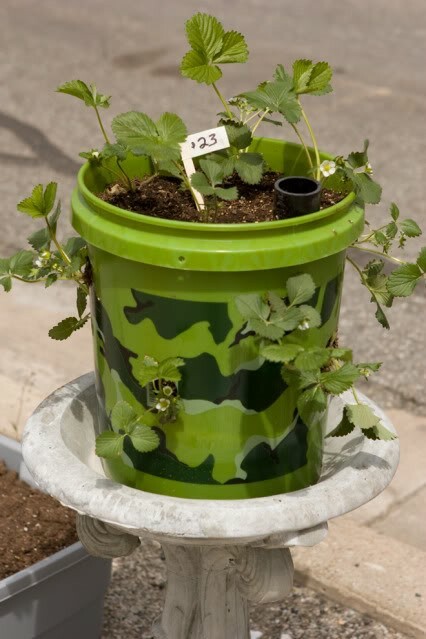 Things to consider include the amount of sun received, water considerations such as if the irrigation system will be able to adequately water the saplings (preferably a deep soak to develop deep, strong roots), and how close the tree will be to other obstructions like cement walkways and other trees with deep root systems. 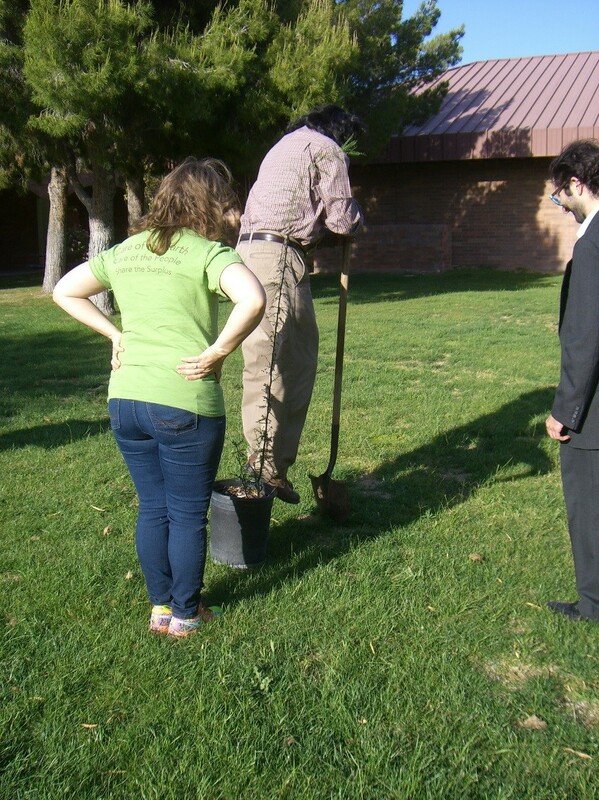 Once they picked the best location, Mr. Sierra eagerly got to digging a hole large enough to fit the base of the 5-gallon tree (yes, he’s jumping on the shovel). It is important, Aimee pointed out, to dig a hole deep enough for the base to fit comfortable in and with enough room to add extra soil on top and around the sides of the tree’s base. After gently releasing the tree’s base from the plastic container, Aimee instructed how to use a paring knife to loosen the roots so they can better spread out into the ground. 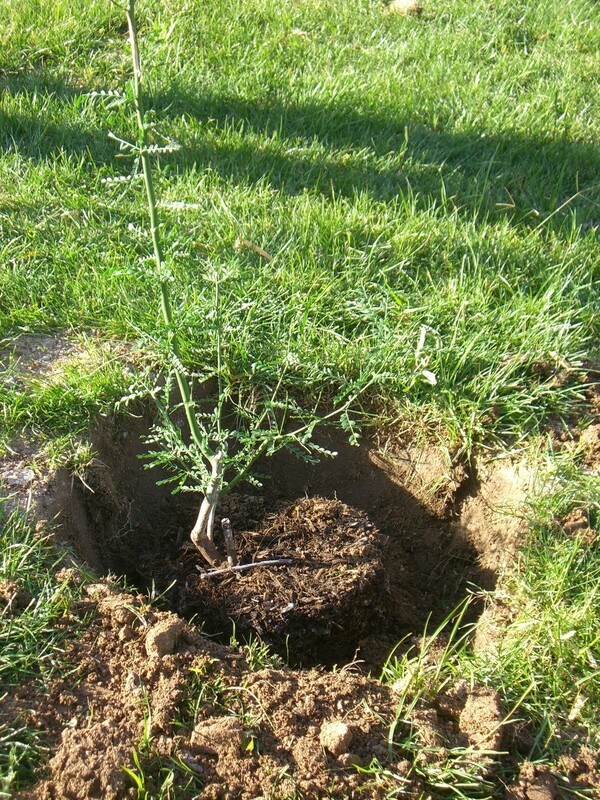 The sapling is then placed in the dug-out hole, ensuring that it is positioned as straight and evenly in the ground as possible. Next, using the soil originally removed to dig the hole, Aimee begins to cover the open areas around and on top of the tree. Finally, she adds compost and mulch to the top surface of the newly planted tree (which was generously donated by Stanford Prescott from Good Things Grow). 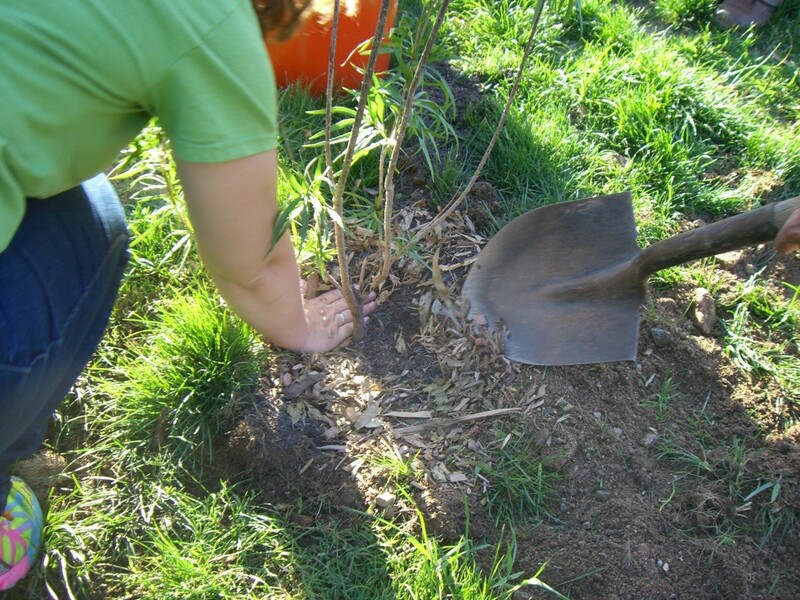 Although not required, compost and mulch provide extra nutrients and protection for the young tree. If you do not have either of these readily on hand when planting your tree, that’s okay--you can add them later. Notice the large spacing Aimee left around the trunk of the tree- at least several inches in diameter. This allow for aeration and proper water absorption around the young tree’s base. Aimme gives a last patting to the tree to ensure it is snugly in the ground. Good luck planting your own young trees! We are here if you have questions, and a video of this tree planting is coming soon! If you attend an in-person tree workshop, part of the presentation covers proper watering techniques. Below we have recapped some of the main points and added several other tips that we hope will address other issues that may come up. 1. First, we highly recommend buying a soil probe (pictured left) because it is hard to determine just how deep water is going. Often people believe that water is reaching deep into the root zone (typically 2-3 feet), but when they use a soil probe they are surprised that the water only reaches a foot underground. A soil probe will slide easily through wet soil but will be hard to push through dry soil. 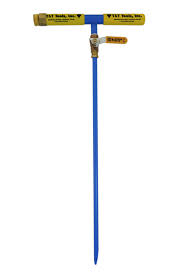 If you do not have a soil probe, you can use a very long screwdriver as well. 2. After planting your tree, you’ll need to determine how wide you want to water around the tree. Most water absorbing roots are located near the dripline--the area under the outer edge of the plant’s canopy--and not close to the trunk. 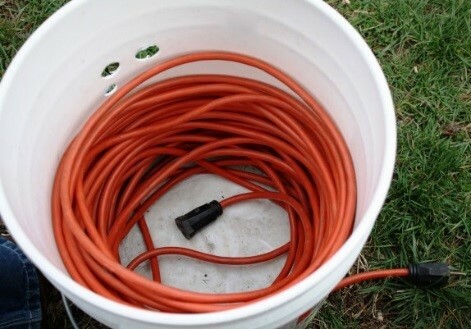 If you are using a drip irrigation system, place the emitters along the dripline of the tree. The water will move down and horizontally as it soaks into the soil, reaching the root zone. If you are using a hose, make sure and water along the dripline area. 3. 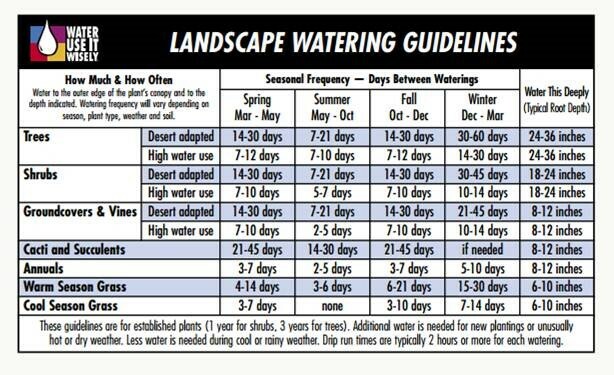 While watering frequency and depth depends on the season (refer to #7), often the rule with desert-adapted trees is deep but infrequent watering. Do not perform water soaks for more than 24 hours. Also, trees kept in standing water for more than a week will cause a desert-adapted tree enough stress for it to drop its leaves, a common stress response. 4. The rate at which your soil dries out between watering depends on the soil type you have. Most soils in the valley are clay and, therefore, watering more than once or twice a week to the proper soil depth of 2-3 feet can drown the young trees (again, a soil probe will greatly help here). Clay soil retains moisture and you will most likely not need to water your tree more than 1-2 times a week during the hottest summer months. 5. Water in the early morning or late evening so more water reaches the roots instead of being evaporated by the sun and wind. 6. Applying mulch, such as wood chips or compost, over your tree’s root zone will help keep moisture in the soil longer (and keep it warmer during the winter). Make sure and keep mulch 2-4 inches away from the tree’s trunk for proper aeration. 7. Often, first signs of tree damage is the wilting and loss of leaves or discoloration. Pay attention to the tree’s leaf growth and adjust the watering as needed. 8. As your trees grow and the weather changes, so will the watering requirements. Below is landscaping watering guidelines. Locate the desert-adapted trees section to find the suggested watering frequency and depth for each season. After performing our quarterly follow-up tree care for residents throughout Maricopa County, one thing we noticed was that many people had chosen to stake their tree. Some people said the wind was too strong for the tree or as their tree grew, it leaned too much to one side. Although staking is generally discouraged, we realize the need to stake so we thought we’d explain the proper way to stake a tree. 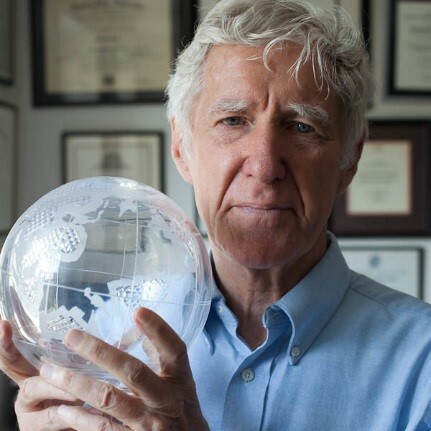 First of all, why is staking discouraged? Because it is important that saplings develop a strong root system early on, as this will be the muscle of the tree and help it grow into a strong, well-rooted tree. Additionally, if a sapling is staked for too long, the trunk will not taper properly and will not be able to support itself. Sometimes staking is necessary but ideally it should be used for only the first 3-6 months and at most, a year. The best way to stake a tree is to place two stakes at opposing sides of the tree (avoid using just one stake if possible). The stakes should be driven into the ground about 12-18 inches deep (make sure you don’t place the stakes through the root ball of the tree) and when applicable, placed into the direction of the prevailing wind. You can also do a 3-stake triangle arrangement for trees needing more support (pictured left). When securing the tree to the stake, it is very important that you secure it LOOSELY so that the tree is still able to move. It’s the movement of the tree that develops a strong root system. 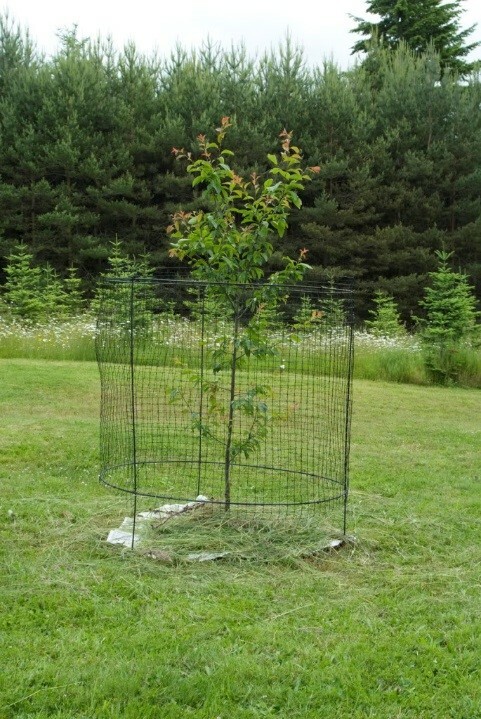 You can use a wire and hose to secure the tree to the stake or even something like an old cloth. Whatever is wrapped around the tree needs to be soft, pliable material so the tree doesn’t get scratched/damaged. Remember, staking is only temporary. If you have other questions or tips about staking, feel free to post in our forums under the Shade Trees category! 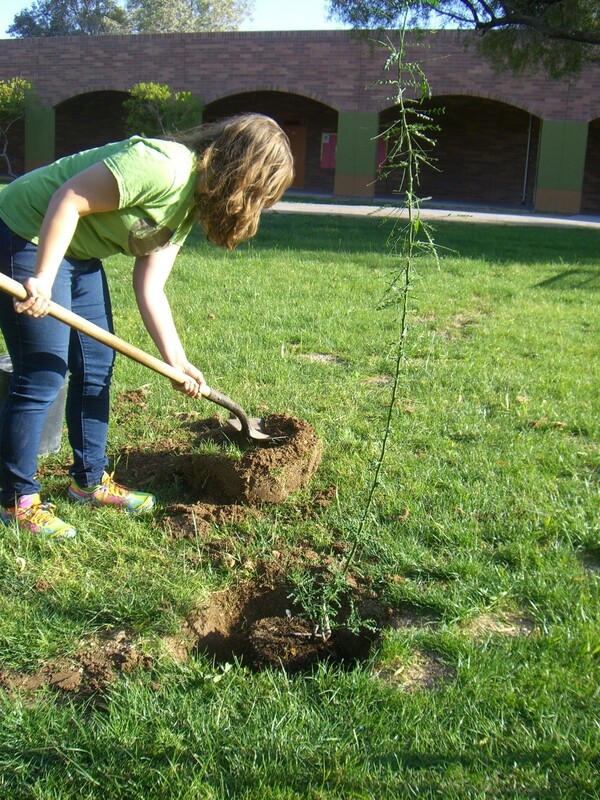 At the VPA, it’s this importance of tree planting that drives us to reach out and educate others not only about the Shade Tree Program but, especially, the many benefits of planting trees. Thank you to everyone for participating in the Shade Tree Program and know that while your reason for planting a tree was, perhaps, particularly to lower your home’s energy costs, you have done so much more!